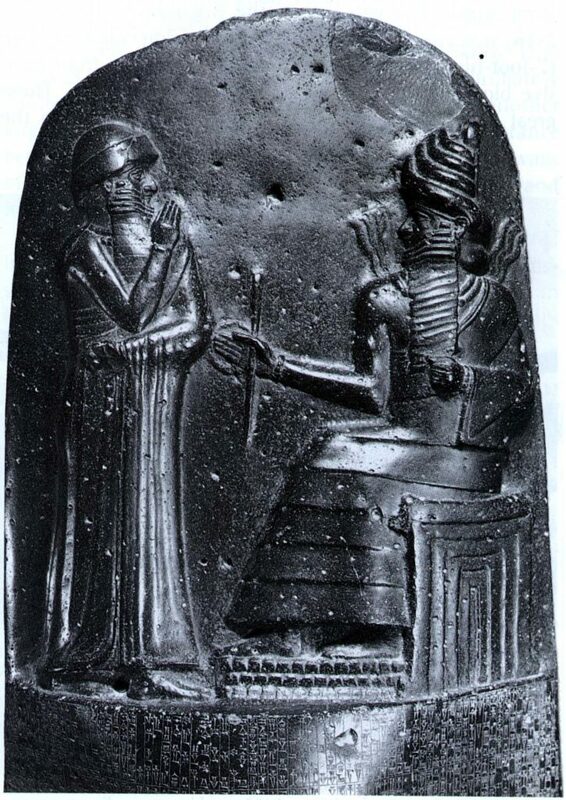 According to people more informed than I am, King Hammurabi (ruled in Babylon, in Mesopotamia, in the early 18th century BC) is the one standing in the posture of respect to the god, who is sitting, holding a symbol of authority, and telling the king which the laws he wants instituted. The classic comparison here is Moses atop Mount Sinai getting instruction from Yahweh; in both cases we see how religion helps to justify the system. These laws aren’t arbitrary! Some human, as important as he was, didn’t just make them up on the toilet one morning. They come from a god, so you’d better obey them. The two notable features of the Code of Hammurabi are retributive justice (“an eye for an eye”), and differentiated punishment, based on one’s social status. Generally, if you harm a social equal, you suffer the same harm back, but if you harm someone beneath you in the social hierarchy (that is, if you’re an aristocrat and you hurt a commoner, or if you’re a commoner and you hurt a slave), you can always pay a fine and get out of being hurt yourself. * Nowadays we’re appalled by this, of course: as the bumper sticker says, “an eye for an eye leaves everyone blind!” And really, if someone harmed me, I wouldn’t be satisfied by getting to inflict the same harm on him – I’d much rather have some cold hard cash for compensation instead. But I have a theory about the lex talionis. That is, nowadays murder, assault, battery, grievous bodily harm, etc. are all crimes – crimes against the state, whose subjects have been harmed and whose peace has been disturbed. Thus does the state reserve for itself the right to punish such actions. This wasn’t always the case – in many other times and places hurting someone was something between you and him – or more accurately, between your people and his people. The state was much more self-interested and self-preservative. Harming someone else was like putting up a fence three feet beyond your actual property line and trying to claim a bit of your neighbor’s yard. This is not something he can call the police about, and it’s not something that anyone will even enforce save for him complaining about it. Violent revenge, in other times and places, was legitimate in a way that it is not in the present-day United States. What retributive justice did, therefore, is to impose a ceiling on the amount of revenge you could take. It’s an eye for an eye – not two eyes, seven teeth, and an ear. It is natural to escalate, to inflict far more suffering than you have suffered, but even ancient states had an interest in stopping such cycles of violence. Thus the proportional (and limited) violence allowed. I hope that enterprising Babylonians taught themselves how to swim. Agriculture was dependent on irrigation – but everyone had to pull together to make sure that it worked. Oh, the farmer and the shepherd should be friends! It’s interesting how you either raised crops or you raised animals – rarely did people do both. It’s also interesting how raising crops seems to be the more important activity here – in contrast to ancient Hebrew society, which seemed to favor pastoralism (viz. the gifts of Cain and Abel in Genesis). 104. If a merchant give an agent corn, wool, oil, or any other goods to transport, the agent shall give a receipt for the amount, and compensate the merchant therefor. Then he shall obtain a receipt from the merchant for the money that he gives the merchant. Here we see evidence of long-distance trade carried out by merchants and their employees – and the perennial temptation to cheat. Then as now bars were disreputable places. They watered down the liquor! They were so bad otherwise that the Babylonian equivalent of nuns were forbidden to enter them. I wonder if they weren’t associated with prostitution, with the feminine tavern-keeper playing the role of the madam. It’s definitely a man’s world in ancient Babylon, but I like how women have some rights. Here, she can actually initiate divorce, and as long as she is “guiltless,” she can leave. So Babylon had professional physicians. I wonder if the ten shekels was a floor or a ceiling – that is, was it an especially generous reward for competence, or was it a maximum, to prevent the greedy physician from charging even more? Note that you were punished exceedingly if you failed. That’s just the way it is in the Code of Hammurabi! This entry was posted in Ancient History, Legal History, Mesopotamia by jgood. Bookmark the permalink.